This has the most amazing lemon smell! With dark green pointed leaves and tiny white flowers. You can use the leaves for making tea&comma; the oils can be used in desserts&comma; cakes and pot-pourri. 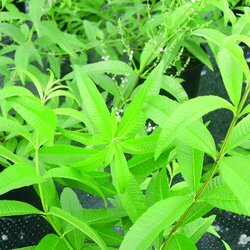 The leaves are used for treating nausea and flatulence. In late spring early summer.